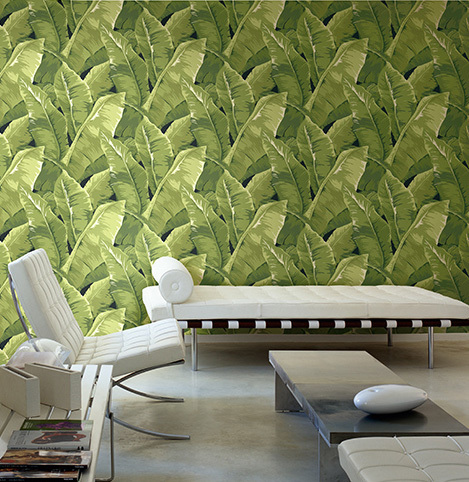 Trending for 2015 are tropical leaves but if you really know about style, banana leaves are always in fashion….and a classic design! The Banana leaf has various symbolic meanings. In Africa, Banana leaves symbolize abundant fertility and are used in a ritual to make women fertile. Did you know that the flowers that turn into the banana fruit are sterile and because of this, Buddha made the banana plant the symbol of futility of earthly possessions. In Asia, the banana plant is considered a very large herb and not a tree as it doesn’t have any seeds and because of this, it was considered the first gift from the gods. Classic Chinese iconography shows Buddha meditating on the key to wisdom at the foot of a banana plant. With all that being said, I love the beauty and boldness of a large banana leaf print in a home and could easily meditate in this room. The Buddha are so wise! Images Copyrighted from Jaima Brown Home. Wallpaper from Charleston Home by Jaima Brown Home brand.